Okay. We have reached the end of Running of the Bulls week. And what more fitting model to end with than with Lamborghini’s most recent model, the Centenario. The Centenario was released in March of 2016 and was built to celebrate what would have been Ferruccio Lamborghini’s 100th birthday. Technically, I could have shown this with the Aventador, as it is based on that model. But that would have left me a day short. But it also gets its own day as it is part of a new trend of limited edition models at Lamborghini. Now I don’t know the reason behind it, but I think it’s in part due to the need to have something special when the regular models seem to be rather commonplace, at least among those who can afford them. If we go back to the Gallardo and it’s 14k+ sales, that’s more than all other Lamborghini’s combined up to and including the Murcielago. And, except for it’s introductory year, the Aventador has averaged about 1k units per year. So how do the multi-billionaires separate themselves from lowly multi-hundred millionaires? Why with an even more limited model. 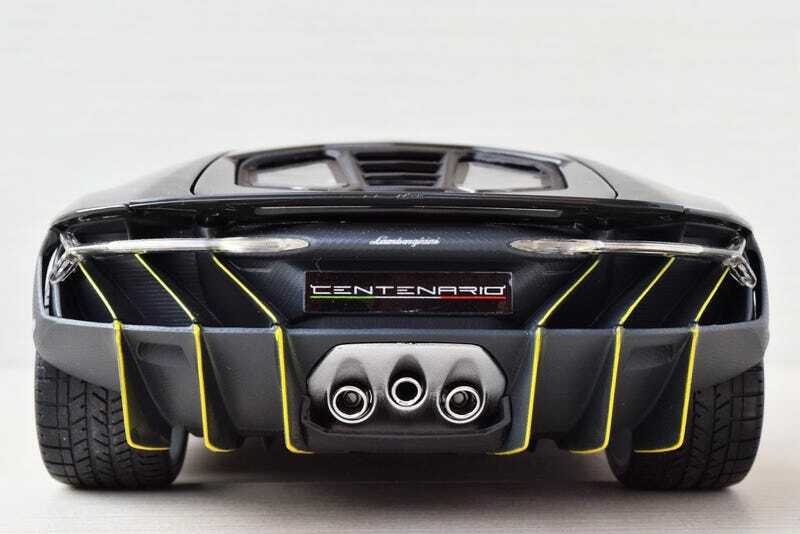 So to me the Centenario is descended from cars like the Reventon, Veneno, Aventador J, and Sesto Elemento. The model comes to us from Maisto, and it’s actually a Maisto, not a Bburago in a Maisto box. Which means this is built a bit different than the Huracan we saw yesterday. Make no mistake, this is still a budget model (I paid $20 for it) but it comes across as a better model than the Huracan. It lacks the overdone interior textures of the Bb and has better paint than both the Bb and Welly. One nice feature that I discovered after taking the pictures is the rear spoiler is movable. It still has Maisto’s traditional 1-piece rotor/caliper combo, and no attempt was made to enlarge it or make it look like carbon composite. Androoo, you’ll be happy to know that the Maisto wheel wobble that provides the camber you love so much is not present, at least on my model. And with that, Running of the Bulls week comes to a close. If I ever have an idea that involves 7 posts in 7 days, please shoot me and take my models. Ciao!